NEW YORK, Feb. 6 -- A U.S. figure skater whose family comes from Ukraine has won the right to compete in the U.S. National Synchronized Skating Championships. Eva Borsuk, 17, whose family is from Kyiv and Lviv, is heading for the U.S.’s main tournament in the sport known as a ‘synchro’ after winning the U.S. East Cost competition. Eva, who resides in New York City, and her teammates from Team Image won Gold Medals with a powerful performance at the Eastern Sectional competition in the Junior division in Worcester, Massachusetts, on Feb. 2. About 3,000 figure skaters participated in the East Coast championship this year, according to the United States Figure Skating Association, or USFSA. 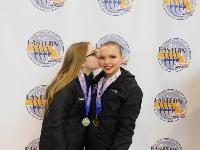 Eva’s sister Ustina Borsuk, 12, and her team won a bronze medal in the Juvenile division and will also participate in the U.S. national championship. Team Image represents the Yonkers Figure Skating Club. Synchronized skating is a sport where between eight and twenty figure skaters perform together as a team. They move as a flowing unit at high speed over the ice, while completing sophisticated and precise footwork. It uses the same judging system as singles, pairs and dance. The discipline is yet to be admitted into the Olympic Games. While most team sports are still dominated by men, synchro figure skating is opening up opportunities for girls. Synchro skaters utilize ice dance skills, freestyle and pairs’ elements, such as lifts and death spirals. Eva traveled to Kharkiv, Ukraine in the summer of 2017 to help the country’s only synchronized skating team Interstellar build a competitive program and to encourage local girls. The Interstellar team is led by coach Yulia Beletska. Eva, who is fluent in Ukrainian and Russian, lived in Kyiv, Ukraine, before moving with her family to the U.S. at the age of 5. She began ice skating in Ukraine and continues working with coaches in Kyiv and Kharkiv spending several months a year in Ukraine. The U.S. national championship will be held Feb. 28 through March 2 in Plymouth, Michigan, the state where U.S. synchronized skating was born. In 1956, the first synchronized skating team was formed by Dr. Richard Porter, who became known as the 'father of synchronized skating.’ The 'Hockettes' skated out of Ann Arbor, Michigan, and entertained spectators during intermissions of the University of Michigan Wolverines hockey team. The sport was originally called ‘precision skating’ in North America, because of the emphasis on maintaining precise formations and timing of the group. During the 1970s, the interest for this new discipline spawned tremendous growth and development. Teams were developing more creative and innovative routines incorporating stronger basic skating skills, new maneuvers and more sophisticated transitions with greater speed, style and agility. Due to the enormous interest in the sport in North America, the first official international competition was held between Canadian and American teams in Michigan in March 1976.